Audi reveals diesel A3 concept car | What Car? Audi has produced the A3 TDI Clubsport Quattro concept car to showcase its diesel technology. The car's engine has been developed from the 137bhp and 167bhp engines already on sale in the A3. However, thanks to improved turbocharger performance, this unit has 220bhp and 332lb ft of pull. Despite these impressive figures, the car meets Euro V emission standards, which are not due to come into force until 2010. The car also has four-wheel-drive and a six-speed manual gearbox, which is cased in magnesium to keep weight down. As a result, the car travels from 0-62mph in 6.6sec and has a top speed of 149mph. Stopping power is provided by standard brakes at the rear, but by uprated six-piston brake callipers and ceramic brake discs on the front wheels, while handling is improved by the addition of lowered and enhanced sports suspension. Audi's latest driving features are also included: Drive Select allows the driver to vary the throttle response, exhaust sound, when the stability control cuts in, the suspension settings and the amount of assistance provided by the power steering. These can be changed to a provide comfort or dynamic driving characteristics, or individually programmed settings. The car's sporty credentials are further enhanced by a performance exhaust, racing-style rear spoiler and diffuser, wheelarch extensions, 20-inch wheels and racing bucket seats. There are no plans to put the A3 TDI Clubsport Quattro into production. 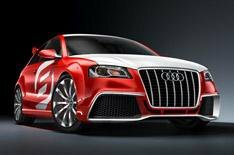 However, the car does showcase the sort of performance that can be extracted from a four-cylinder diesel engine, so it is an area that Audi could develop in the future. The A3 TDI Clubsport Quattro was unveiled at the Lake Worther Tour, an annual gathering of horsepower-mad Audi and VW enthusiasts in Austria. Audi was also showing off its R8 TDI Le Mans study, which was previously seen at this year's Geneva motor show. Its 496bhp 6.0-litre diesel has 738lb ft of pulling power, and takes the car from 0-62mph in 4.2sec.